I need your help - I've got twelve blocks from the Sew Happy Geek QAL that I finished up a few months back that I want to sew together into a quilt. 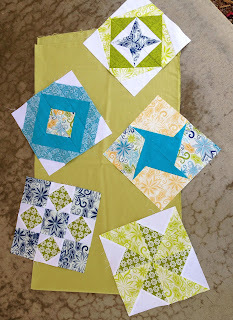 I was out shopping yesterday and brought the blocks with me to see how they looked with various Kona colors in the quilt shop. I choose to go in the green direction instead of blue as I think it balances out the blocks better. What do you think? 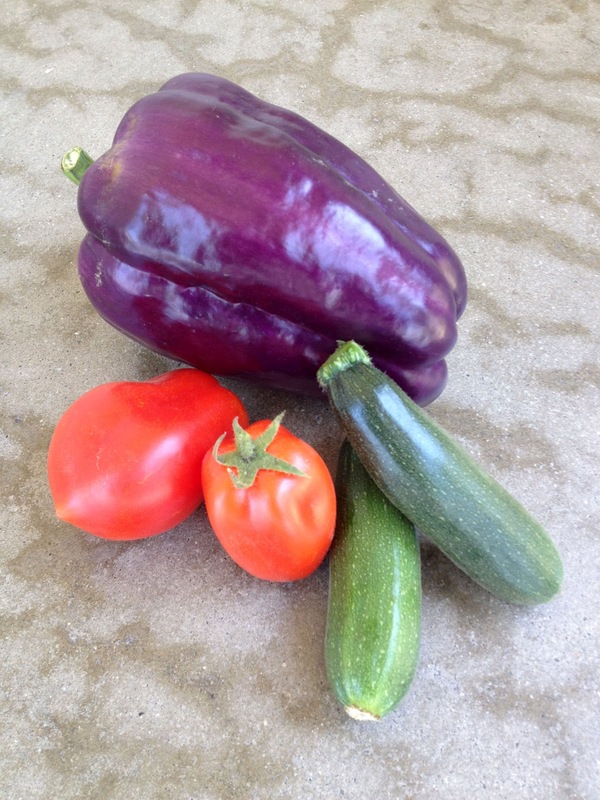 A lilac sweet bell pepper, two roma tomatoes and two tiny zucchini. The zucchini flowers on my plant are teasing me with their potential to be stuffed or fried. I've never eaten or made stuffed zucchini flowers but I'm dying to try something new. P.S. The title of today's post is courtesy of my 14 yr old. He walked by as I was writing the post and I asked him what he thought I should title the post with...."fresh greens" he replied with a smile. Love that boy. I like your blocks and the green looks good. I am partial to blue so I probably would have gone with navy and splash of teal for spice. What do those lilac bell peppers taste like? i have never seen them. Your boy did well with the name. Catchy and fitting all the way around. Green, definitely green. Love your harvest. I harvested a whole bowl of little yellow grape tomatoes yesterday. oh I think the blocks look great on the green you chose! nice. And lovely veg - we had some sort of zucchini flowers in Italy - you should totally try them since you have them! and then tell us! Your garden is doing well! I am looking forward to seeing how you arrange the blocks for your quilt. That green was a wonderful choice! Love your garden harvest, too. Such cute little zucchinis! So far all we are getting are cucumbers and radishes. You should definitely try doing something with the zucchini blossoms. I don't think I've ever had them, but I've seen lots of fun recipes. Maybe green sashing with a little blue cornerstone? Or no sashing, blue inner border, green outer border? Love the green--great choice. And I would love to know more about that lilac bell pepper--not something I've seen in these parts.